The U2713HM is an LED-backlit display that offers the sRGB colorspace and a resolution of 2560x1440. It uses an IPS panel that is 8-bit, but unlike the U2711 doesn’t support AFRC for simulated 10-bit color. Like all Dell monitors I have seen so far, it has a base that supports height, tilt, pivot, and swivel adjustments. Installation is a snap with Dell’s standard mounting system where you just slip the monitor onto the stand and it clicks into place. The front is nice and clean, lacking any stickers or text aside from the Dell logo, and all the OSD controls are handled by a set of unlabeled buttons on the right-hand side. 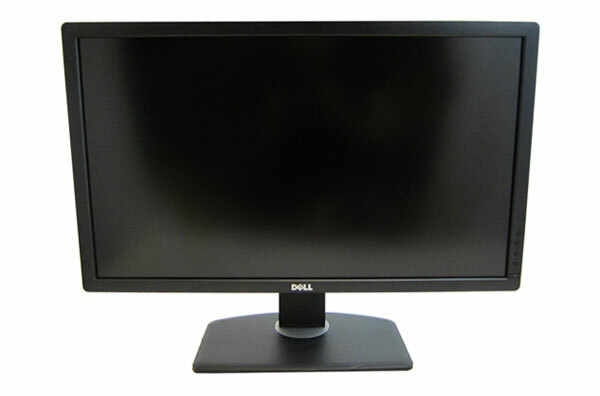 I have to complement Dell on the packaging for this monitor as well. Totally forgoing Styrofoam and only using a simple cardboard design, similar to recent Sony Blu-ray players, it both keeps the display safe and doesn’t fall apart, making it easy to reuse the packaging later. If you aren’t keeping the packaging, it also makes recycling the included materials much easier. I appreciate both the eco-friendliness and the ease of removing the monitor from the box. Dell thankfully puts a page detailing the monitor setup at the very top of the box, something other vendors would be wise to start doing. Dell's U2713HM also offers 2x USB 3.0 ports on the side, and two more on panel with the video connections. The panel offers DisplayPort 1.2, VGA, DVI, and HDMI inputs, as well as a connection for Dell’s soundbar speaker. The PSU is integrated into the display so there is a standard 3-prong IEC socket rounding out the connections. Nothing on the U2713HM is flashy or groundbreaking; it's just very utilitarian. It’s not going to stand out in a way that makes you remember it at first glance, but after using so many other displays I also find there isn’t anything poorly designed that stands out either. Overall the design of the Dell U2713HM is clean and well done. I have always given Dell high marks for their OSD and I will continue to do so here. With four buttons to control it, none of which are labeled, you would think it might be tricky but it is not. With clear on-screen labels and descriptions of the controls, as well as avoiding the common mistake of having keys labeled with arrows control menus that move the other direction, Dell does a good job here of making it easy to navigate and control. The menu options are clear, with your standard preset modes, brightness and contrast, input selection, and more display settings. One missing item is an option for an overdrive or gaming mode to improve pixel response, though in practice we haven't seen major improvements from such modes on other displays. Another missing feature is the ability to automatically select an input, which makes using it with multiple devices a little harder. The OSD remains essentially unchanged from previous Dell displays, but they have no reason to go back and reinvent it either. Viewing angles are good for an IPS as we expect them to be. There is a light coating of anti-glare, but nothing that I find to be objectionable or that caused issues with the image for me. Unless you're trying to look at the U2713HM from a 170 degree angle or so, you shouldn't have any issues viewing it and seeing color or contrast shifts in normal use. Dimensions w/ Base (WxHxD) 25.17" x 7.89" x 16.70"
The design and user interface of the Dell U2713HM seem to be up to the task, but how does it perform relative to other 27" models that have recently come through for testing? First 27" with an all-USB 3.0 Hub. That alone is worth something. I've got one on order and I hope these are going to last as long as the several HP LP2465 monitors that I've been using for most of a decade. The USB hubs in those were incredibly reliably as well, and I'm hoping that the all-USB 3.0 hub in this Dell 27" model is up to the task. As far as value goes, sure the Korean models might be good for a second or third monitor, but with the Dell you *should* get grade A quality (at least for an enthusiast, if not for the professional), under a fairly full kit of options and functionality. For something that I'm hoping might last 10 or 15 years, like my other monitors, the probable annual amortized cost difference is fairly negligible. Too bad they had to drop to 24-bit (from 30-bit) to get the cost under control. Still, if the USB 3.0 hub can handle everything I throw at it and the monitor can still offer up better resolution than my existing 1920 x 1200 monitors, then its a great value. The Korean monitors (Achieva, Yamasaki... just to name a few) you're talking about use LG eIPS display. Actually those LG displays are rejects or did not meet quality requirements for Dell or HP. You'll probably get at least a couple dead pixels on those Korean monitors. Who knows what other defects they might have. That's why they're much cheaper. ROFL@anyone willing to give their CC# to a Korean company from ebay etc. Even the ones on Amazon have 1 review, a Gmail address for returns/help, no about page, a blank faq page, no phone# to call etc. How dumb can you be to buy one of these? If you don't even own a domain I can't be bothered to even think about your company as relevant to my purchases...LOL. How do you know the Dell lasts a while longer? Like we know everything about the Korean monitors.